Horizontal hierarchy: organization progress or more complexity? Our organizations are structured around vertical hierarchies and for decades organization researchers and consultants have worked on how to structure these vertical hierarchies, on what was the most important dimension to keep as the pivotal structure (regions, functions, products… you remember these debates) for creating the silos. Then, the following question was on how to superimpose on it the next important dimension (remember the matrix?) for creating the best of possible (or the “least worst” possible) cooperation among silos. All these elements of organization have one conceptual point in common, the transaction cost theory of the firm. In (very) short it says (more on Wikipedia) that a hierarchy, i.e. a structured relationship of dependence, is better for a firm as long as it reduces the transaction cost that would occur if the parties were interacting via “the market”. Most of this theory has first justified the in-firm integration of function from research to production to sales, the development of work contracts (creating administrative hierarchies of employees), etc. Most of this theory for the last twenty years has then justified the recourse to outsourcing (the transaction costs became lower if the party was external), to self-employed individuals (free lance are not within the hierarchy), etc. Internally, vertical hierarchy is most of the time necessary and matrixes can be quite useful (a matrix line is nothing else than a vertical hierarchy superimposed to the first one). The silos and the matrixes are not yet dead, far from it. But the transaction cost theory, in a world of web 2.0 type of collaboration, changes again part of the game. In this world,collaboration across silos is made possible in a third dimension, not respecting either the silos or the matrix. Individuals can connect, exchange knowledge, motivate each other, and collaborate wherever they are in the organization. Old silo masters hate it (“This guy is working for me, I don’t want him to lose time collaborating with the next silo’s guys”) but the reality is here. 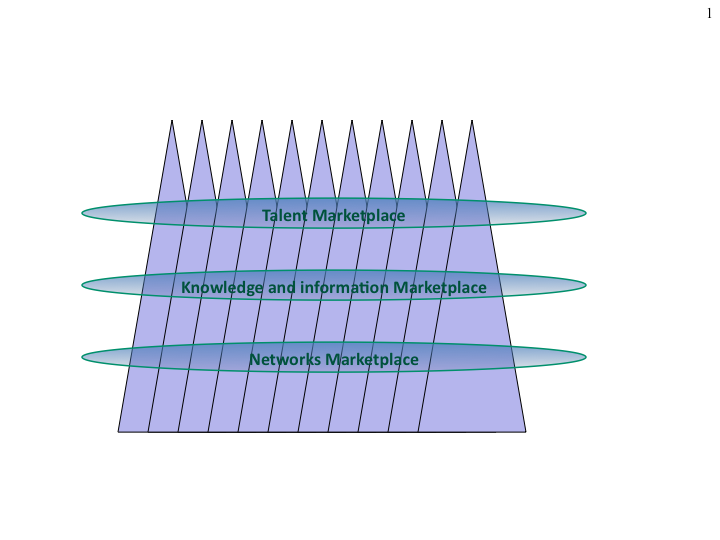 Horizontal collaboration and exchanges even work with the outside (when two alumni exchange problem solving ideas while they work for two different, even competing, organizations, they are applying the transaction cost theory because it is much more effective and efficient to collaborate this way than to use the existing vertical hierarchies). The fact is not new, it existed since corporations allowed the creation of Communities Of Practices (COP) or of project work or any way to shortcut the traditional hierarchy. The development of social networks (“wired” communities) has largely accelerated it and already in 1999 Jon Husband was coining the term of Wirearchy. Today the multiplication of groups of all sorts, virtual or physical (because not all exchanges happening in this horizontal hierarchy are virtual) has made the silos definitively porous and horizontal hierarchy become really effective, efficient and ubiquitous. The term hierarchy can apply to horizontal collaboration even if the (vertical) hierarchical positions of the collaborating individuals are not playing much role, because, as all who collaborate know well, in any group, there are soon hierarchies in the sense of informal non contractual but de facto structured relationships of dependence. In any community, and most importantly in internal communities like the COPs, there are individuals who know more or better than the others on this or that topic. They become respected, “followed”; their advices or their help is sought after. In some cases there are even some sort of monetization of these hierarchies. One IT company for instance had a very strong internal architects COP where the best individuals where contributing (unofficially) to some projects of the weakest ones in exchange of the weakest one doing (unofficially) some simpler work on the project of the strongest one. Thanks to those systems of horizontal hierarchies, transaction costs are drastically reduced, productivity enhanced, engagement enhanced and often innovation enhanced too. The horizontal hierarchy, linked to the dawn of collaborative management and the ability for anyone to access to the collective intelligence is certainly a great and positive revolution for corporations. How to know about those exchanges and the value they bring, at least to measure the time spent, the level and the evolution of the skills of people, the learning happening, the real usefulness of the exchanges? How and when to encourage or discourage the horizontal hierarchies? When could they be harmful? When are they a gain? How to understand and manage the relationship between paid work and voluntary work (the gift economy) in a corporate environment? How to evaluate individuals about these activities? The best ones will want to be recognized formally and will want their skills to be rewarded, financially or otherwise. How to reduce the resulting career frustrations? How to manage the resulting exclusion / inclusion dimensions? As in any group informal hierarchies, when they emerge, tend to create elite castes and pariah castes (the words are too strong but the reality points into that direction) and those inclusion / exclusion dynamics may play against the original benefits of horizontal hierarchies. They may reduce the knowledge transfer and productivity gains, create new factions and reduce the engagement of the weakest. How to manage the balance between real world interactions and virtual interactions in a way that remains “humane” within the company? The more exchanges are virtualized, the more the risk for de facto exclusions. How to understand the new power/ influence/ personal strategy games in this environment? How to limit the collateral damages of intellectual property elements floating around the company and even in the outside? How to edict the new rules related to what should really remain secret? This is still just a checklist of real questions; we will see within the next months, hopefully, a corpus of practical ideas and methods along these axes.